…probably the most comprehensive single volume to look at the use of mind-altering drugs, or entheogens, for ritual and shamanistic purposes throughout humanity’s long story, while casting withering sidelong glances at our own times – as Paul Devereux points out, our modern mainstream culture is eccentric in its refusal to integrate the profound experiences offered by these natural substances into its own spiritual life. Societies of the past have used the psychedelic experience to strengthen, renew and heal the spiritual underpinning of their social structures. The ever-deepening social unease that Western civilisation seems to be caught in is the real source of our ‘drug problem’: natural hallucinogens are not the problems in themselves, it is the context in which they are used that matters. If there were orderly and healthy structures and mechanisms for their use and the cultural absorption of the powerful experiences – and knowledge – we could separate these from the culture of crime that surrounds them now. In short, the problems are not in the psychoactive substances themselves, but in a society, which on the one hand wants to prohibit, mind-expansion altogether and on the other chooses to use mind-expanding substances in a literally mindless, hedonistic fashion. We have already noted that the idea that ontologically independent beings (‘spirits’) or intelligences are contactable through plant-induced trances is standard in most if not all shamanic tribal societies, but to posit such a thing in modern Western societies is viewed as tantamount to insanity, a nonsense notion to be dismissed out of hand. In other words, we can’t discuss it without forfeiting all credibility. This problem concerning the inability to explore certain ideas has been addressed by Oxford-based researcher, Andy Letcher. He uses Foucauldian discourse analysis to critique the models, the ‘discourses’ employed by the West in dealing with the content of altered mind states. These include pathological, prohibition, psychological, recreational, psychedelic, entheogenic discourses. Each has its own imposed boundaries; they are cognitive constructs. Letcher notes that some of these discourses or approaches to hallucinogenic substances ignore the subjective experience of the altered mind states involved, or else place it within an inner, psychological framework rather than it being a case of simply seeing more, of being in a wider frame of consciousness. He critiques even the entheogenic discourse as relying on a “God within” model, divine revelation that does not by any means occur in all altered states. However diverse they might be, all these discourses can be used within the norms of Western culture. Only one discourse crosses that “fundamental societal boundary,” what Letcher refers to as the animistic discourse – the belief that the taking of, say, hallucinogenic mushrooms occasions actual “encounters with discarnate spirit entities.” Because of the deep-rooted modern Western assumption that consciousness cannot occur in any other guise than human (the ultimate hubris of our species, perhaps) discussion of a conscious plant kingdom, or of that providing a portal through which contact with other, ontologically independent beings or intelligences can occur, is simply not possible within the mainstream culture. “It nevertheless remains a phenomenon in need of further scholarly research,” Letcher rightly insists. 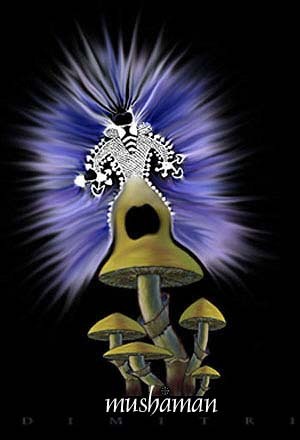 “If one were to reduce to its essentials the complex chemical process that occurs when an external psychoactive drug such as psilocybin reaches the brain, it would then be said that the drug, being structurally closely related to the naturally occurring indoles in the brain, appears to interact with the latter in such a way as to lock a nonordinary or inward-directed state of consciousness temporarily into place… There are obviously wide implications, biological-evolutionary as well as philosophical, in the discovery that precisely in the chemistry of consciousness we are kin to the plant kingdom,” writes Peter Furst. That message may be to do with the need for us to change our minds, or, at least, to broaden our cognitive horizons. The plant kingdom could be urging us to allow the ability to ‘switch channels’ in consciousness terms to let them become a recognised and acceptable part of our emerging global culture. Hallucinogen-using ancient and traditional societies had and have exceptional sophistication when it comes to understanding and navigating alternate states of consciousness, whereas we are still quite primitive and inexperienced in this regard. The manual for using expanded consciousness is a textbook we have not read – or, more accurately, recalled. Not that simply widening our collective experience of consciousness will act like a magic wand and remove all problems and obstacles, but it would help us to make wiser, more whole-some decisions in coping with them. If Western civilisation is truly to advance, we surely must learn to operate within the multi-dimensional capacities of our minds, rather than using the police to conduct an indiscriminate war on the means of doing so. A workable balance has to be struck between protecting the well-being and the orderly functioning of society as a whole, and allowing the human brain-mind to explore its full potential. We are smart enough and complex enough and able enough to make it possible to do both. There are no excuses. 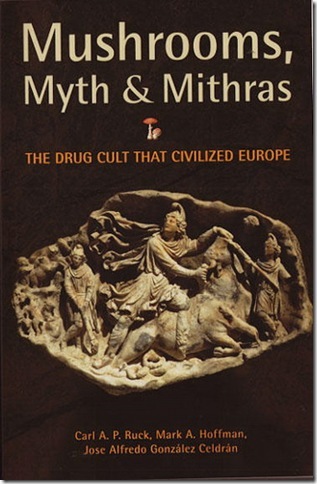 The following is excerpted from the new book Mushrooms, Myths & Mithras: The Drug Cult that Civilized Europe by Carl Ruck, Mark Alwin Hoffman, José Alfredo González Celdrán published by City Lights. Various traditions recall the events of a “First Supper.” In the Judeo-Christian tradition, the story unfolds in a garden called Eden. In that version of the myth, a serpent persuades humans to eat the fruit of a sacred Tree of Knowledge, thus bringing man and God together. In the patriarchal reformation of Judaism, with its morbid dread of the power of the goddess, the story of the First Supper was revised. But even there, the jealous god observes that the food made humans more like Himself, endowed with knowledge of good and evil and the wisdom of the angels. Prior to the recent revival of interest in psychoactive plants and compounds, the need for a new word for these botanical mediators led psychiatrist Humphry Osmond to coin the term psychedelic, “to fathom Hell or soar angelic,” as he described it in a letter to Aldous Huxley. Within just a few years, however, conservative backlash against the 1960s counterculture had contaminated the word with the perception of criminality, recklessness, and abuse. The term was derived from the Greek words psyche, for the “human mind, soul or spirit,” and delos, “clear, manifest.” In fact, early experimentation with such substances in the modern West suggested similarity with psychotic states, as implied in the coinage of psychomimetic and psychotropic. An entheogen is any substance that, when ingested, catalyzes or generates an altered state of consciousness that is deemed to have spiritual significance. Symbolic surrogates, lacking the appropriate chemistry of psychoactive plants and compounds, may induce a similar experience through cultural indoctrination and suggestion or personal subjectivity, and could also be termed entheogens. Like shamanism itself, entheogenic spirituality is dependent upon and defined by the states of consciousness experienced. In many cultures, accessing such states is considered culturally essential to the perpetuation of a society’s underlying natural and spiritual interconnection with the cosmos. Altered states of consciousness are very often considered indispensable to such core shamanic practices as diagnosis of ailments, curing, soul retrieval, and communication with deceased ancestors. In myth, transformations of consciousness are an integral element in the basic story of the hero or heroine who encounters pathways of communication between the human and an otherwise invisible realm, and such experiences are viewed as part of the ongoing renewal of the community’s spiritual well-being. These transformations even underlie the semishamanic philosophies of Gnosis in the ancient Classical world. Among other peoples, they ensure perpetual contact with the wisdom and benevolence of the spiritual worlds. 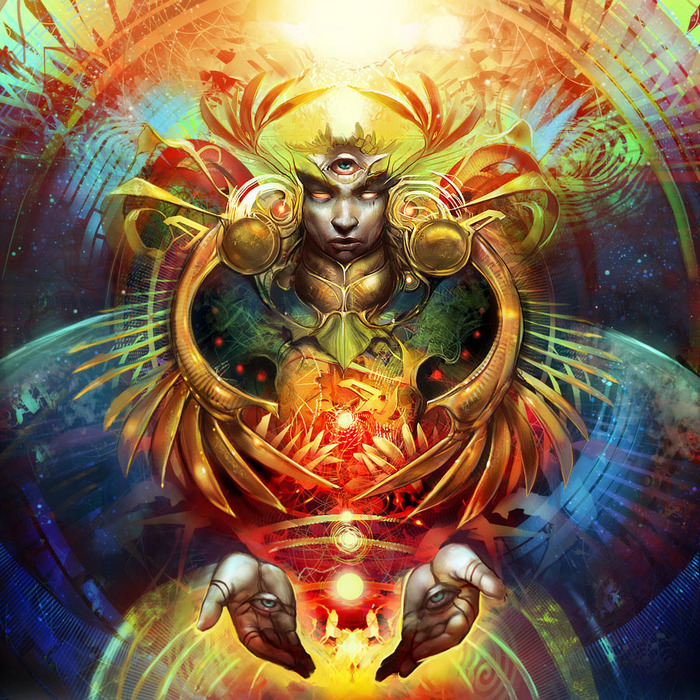 Generally speaking, however, the study of entheogens is a comparatively recent phenomenon, as is their recognition as a formative influence on the shaping of both shamanic and so-called developed cultures. It is now widely accepted among specialists that entheogens and the ethnopharmacology of their plant sources represent one of the most direct, powerful, reliable, and indeed ancient means of inducing “authentic” shamanic states of consciousness. Entheogens may, in fact, be the most reliable way of inducing a profound and sustained alteration of consciousness commonly associated with ecstatic, shamanic states. Hence they are at the heart of such dependable and repeatable ceremonies as initiation rituals and other religious Mysteries. When entheogens are taken in the context of a society’s sacred shamanic ceremonies, the culture’s mythopoetic traditions are often relived and reinfused with profound immediacy and power, heightening their spiritual sense of connection. Entheogenic epiphany is commonly described as a state in which people experience their individual distinctions dissolve in a mystical, consubstantial communion with a force of profound sacred meaning. This ecstatic experience is interpreted as a pure and primal consciousness and sometimes described as the direct contact with the unobscured root of being. Since shamanic spirituality is inherently practical, it ascribes the highest importance to the regular access to such transcendental states; this point of contact ensures the undisturbed continuation of natural cycles and helps perpetually maintain a society’s underlying sense of centeredness, equilibrium, and balance. From a shamanic perspective, ecstatic contact also protects against the potential dangers of unappeased or neglected gods or spirits. The entheogenic experience, though entirely strange, dissimilar, and inexplicable in mundane language, is often described as feeling more real and vibrant than ordinary consciousness. Some of the plants used for shamanic rituals have yielded important medicines, for shamans are traditional healers, often called “wise ones.” Other substances open up pathways to otherwise unseen worlds, with the spirit of the plant as guide to repair the invisible imbalance that is the cause of disease and plague. The word medicine has cognates in all the Indo-European languages and is related to meditate and middle, implying the doctor’s original role as an entranced mediator. Most probably derived from the Middle Dutch term droge vate (“dry vat”), the plants and substances employed were eventually called “drogues” in Middle English because they were usually dry when found in the apothecaries, which were also shops for poisons. The word was applied to narcotics and opiates toward the end of the nineteenth century. This has given “drug” an unfortunate pejorative connotation that dominant religious groups often use to describe substances used by other spiritual communities. Similarly pejorative is the reference to entheogenic experience as “hallucinatory,” which once meant “dreamlike wandering,” but it has come to imply delusion and disconnection from reality rather than a heightened access to it. Fossils show that approximately 1.5 million years ago, a sudden and scientifically baffling development in the proto-human neocortex emerged. It has been speculated that the explosion in brain size, the prerequisite for the evolution of modern humans, occurred when our hominid ancestors began to intentionally and regularly consume consciousness-altering foods. Such an important adaptive aid would have been well suited to our “trickster” disposition for creative thinking. Thus, in keeping with the myths of old, we suggest that perhaps our species did indeed first become truly human when we first ate of those sacred Eucharistic foods-initially by individuals, and then ritualistically in groups, in what can be seen as First Suppers. Early humanity has left compelling testimonies of its entheogenic traditions in the archaeological record. In the Shanidar cave in Iraq, there is evidence that approximately 60,000 years ago Neanderthal culture had specialized knowledge of medicinal plants and incorporated them in the burial of an apparent shaman leader. Today shamanism is recognized as the primal and universal belief system reaching back to deepest antiquity, a practice that survives intact in many cultures around the world. Its influence on the historical emergence of Western civilization, however, has been all but ignored. Historians of Europe’s debt to the Greco-Roman tradition have been largely blind to it in their own backyard, apart from admitting, for instance, that the Druids may have been shamans and that shamanism was the likely archaic, animistic religion of Paleolithic “Old Europe.” Even less of a shamanic provenance is ascribed to the Classical tradition, that great fountainhead of Western civilization. Nevertheless, there were shamans in ancient Greece and Rome, and ongoing research continues to ascribe central entheogenic elements to the most historically important and influential ancient religious rites. At first it was assumed that shamanic techniques were a foreign importation imitated by those peoples along the shores of the Black Sea in the regions of Scythia and Thrace who, in turn, would have adopted the practices from their neighbors, the Tungus people of Siberia. It was there among the Siberian tribes that shamanism was first recognized and described by Western scholarship as a priestly practice. As early as the sixth century BCE, various Greeks are described as having magically traveled to the mythological lands of the Hyperboreans, who dwelled beyond the North Wind. Using innovative means such as the toxins of their arrows or by metamorphosis into birds, they made the journey in order to visit the god Apollo while their bodies appeared lifeless. Upon returning, these Greek priestesses and priests were believed to have the ability to banish plagues and predict earthquakes. One of these travelers is credited as the founder of Apollo’s great sanctuary at Delphi. Here the god’s entranced prophet was consulted even by the leaders of nations, her unquestionable validity being such that Socrates devoted his life to fathoming the meaning of her famous ironic declaration that he who knew only that he knew nothing was the wisest man in Athens. What else could one call this world-renowned priestess but a shaman? Nor was she alone; the experiences and beliefs of many important philosophers (as well as other very influential Greeks and Romans) qualify them as shamans. For example, the great mathematician Pythagoras, who lived in southern Italy, established a religious community devoted to dietary and spiritual practices, including the descent into caves that would induce the vision of the underlying mathematical relationships upon which this world of appearances is based. We have an eyewitness to the shamanism of Pythagoras’s contemporary Empedocles, as well as his entheogenic claims. Empedocles declared that he knew of all the drugs and could teach them to his initiates, for he had drunk fire from an “immortal potion” and could now calm or summon storms at his will and lead the souls of the deceased back up from Hades, the realm of the afterlife. Such shamanic prowess is also described among the Gnostic Orphic religious communities, who claimed that their founder had a unique dietary regime and a special ecstatic “smoke” (probably referring to the inhalation of sacred incense). Orpheus, a priest of the Hyperborean Apollo, could summon beasts and was apparently considered an incarnation of his god since, upon death, he was compounded into an inebriating potion by his ecstatic female devotees while his disembodied head continued to prophesy. His devotees believed that the body (soma) was a tomb (sema), that this life was a deathlike incarnation of the soul that would be liberated upon death (as it is temporarily during ecstatic trances), judged and recycled through an astrological-planetary curriculum before reincarnating for a series of further trials on Earth. This process continues until the soul finally achieves “perfection,” a condition described as a kind of a celestial actualization. This basic shamanic idea of a detachable soul limited to Orphic doctrine underlies the literature of the Classical Age, where the soul is considered most alert and free in sleep, dreams, and trances, where it can acquire some of the knowledge it will attain upon the final liberation of death. This redemptive theology is consistent with the metaphysics of Empedocles and many other ancient models, including that of Roman Mithraism considered in the present work. Parmenides gave an account of his soul’s journey to the gateway between night and day, where he met a goddess who imparted her teaching of the Gnostic Vision. He was said to have produced the laws of his city after a vision quest in a cave. He and Pythagoras were not alone in achieving visionary knowledge. Plato explicitly claims that his dialogues are just the preparation for a vision of the Ideal or archetype of reality that only comes after an extended regime of spiritual practices, for which he employed the famous metaphor of the Cave and a Mystery initiation. Plato, like Aristotle after him, was initiated into the venerable entheogenic Mysteries of Eleusis, the experience of which certainly colored his model of a visionary community, and the resulting revelation is thought to have deeply influenced his Doctrine of Forms. Thus entheogenic shamanism is also at the heart of what we have come to call Greek philosophy. Sophists and philosophers were probably all shaman priests, at least in the common mind; a sophist, after all, is nothing other than a sabio or sabia. It was from such a “wise-woman,” the famous Diotima, who was also adept at banishing plagues, that Socrates learned the metaphysical nature of love that he expounds in the Symposium. Aristophanes parodied Socrates as a sophist-shaman, first in Clouds, where his community of disciples was shown digging up special roots in a profanation of a Mystery initiation and hallucinating on clouds of cannabis smoke. And later, after the actual scandal of the Profanations, when certain prominent Athenians were discovered to have used the Eleusinian potion for recreational purposes at their drinking parties, he was shown in Birds again profaning the Mystery in a shamanic rite of necromancy as he summoned up spirits of the dead through the medium of an entranced companion. As is clear from the monastic communities of “wise-men” like Pythagoras, Plato, and the Orphics, shamanism came to be practiced as a group experience. The great Eleusinian Mystery was of this type, a shamanic initiation in which participants journeyed the other world in order to experience personally the opened pathway between the realms. The psychoactive agent for the mixed potion or kykeon was derived from ergot, a fungus that grows on grains. The Mystery was enacted for nearly two millennia and most of the greatest personages of the Greco-Roman world were initiated. Cicero testified that it was the paramount contribution of Athens to the civilized world. The Eleusinian ceremony was only the best known of similar Mysteries, like that of the Kabeiroi, enacted at various other sites. Such communal shamanism was also the basis of the maenadism of the female devotees of Dionysus. Periodically the women of the city deserted their homes for a mountain revel where they enacted herbalist rituals and induced a rapture that has become the touchstone example of ecstasy. The men induced something similar in the drinking parties or symposia, where the wine was fortified with consciousness-altering additives. Dionysus’s most enduring gift was his patronage of the theater. Drama began as a shamanic experience, with an entranced narrator evoking the spirit of a deceased ancestor from his tomb to impersonate his story. As it developed in the sixth and fifth centuries BCE in Athens, it became a communal experience of shamanic possession spreading from the actors outward to the surrounding audience. To place them in the properly receptive mind, a special vinous potion was offered throughout the several days of performances. The great playwrights themselves appear to have composed their dramas in a state of shamanic trance and possession. The Indian and Persian Soma rites, moreover, persisted among the early Indo-European immigrants to Mesopotamia and were assimilated by Semitic and other peoples, elements being incorporated into ancient Judaism and the Egyptian Mysteries. By the Hellenistic period, similar and derivative entheogenic rituals were well established among spiritual communities like the Therapeutai, a mystical Jewish group with such pronounced similarities to Christianity that they were once thought to be the earliest documented monastic community of the sect. From the shores of the Dead Sea, the Essene brotherhood is another group that influenced early Christian practice, being exposed to the trade routes with the Orient that facilitated the mingling of ideas between the great civilizations of Eurasia. The Persian Magi were visitors to many ancient cities, performing their shamanic rites from the Athenian marketplace to ancient Judea and beyond. Moreover, port cities like the Peiraieus of Athens and Roman Ostia had multiethnic populaces with sanctuaries of their foreign rites. Journeying in the opposite direction, the shaman Apollonius of Tyana, a contemporary of Jesus and also declared a god, was actually initiated into a Soma rite by Brahmans in India. The Christian version of the rite was suppressed by the dominant Church or reserved for its elite, but it persisted at least as late as the seventeenth century in various Gnostic sects, notably among the followers of Mani in the East, condemned as heretical although even in Europe Manichaeism and occult Mysteries like alchemy persisted or were repeatedly reintroduced by travelers from the Holy Lands of the Middle East. Thus, as we can see even from this cursory treatment, many of the most significant developments of Western culture were inspired by a central spiritual, ecstatic impetus that most often, if not always, included access to altered states through the use of entheogens. In light of recent specific liberalizations in drug laws in some countries, this article investigates the potential of entheogens (i.e. psychoactive plants used as spiritual sacraments) as tools to facilitate existential intelligence. “Plant teachers” from the Americas such as ayahuasca, psilocybin mushrooms, peyote, and the Indo-Aryan soma of Eurasia are examples of both past- and presently-used entheogens. These have all been revered as spiritual or cognitive tools to provide a richer cosmological understanding of the world for both human individuals and cultures. I use Howard Gardner’s (1999a) revised multiple intelligence theory and his postulation of an “existential” intelligence as a theoretical lens through which to account for the cognitive possibilities of entheogens and explore potential ramifications for education. In this article I assess and further develop the possibility of an “existential” intelligence as postulated by Howard Gardner (1999a). Moreover, I entertain the possibility that some kinds of psychoactive substances—entheogens—have the potential to facilitate this kind of intelligence. This issue arises from the recent liberalization of drug laws in several Western industrialized countries to allow for the sacramental use of ayahuasca, a psychoactive tea brewed from plants indigenous to the Amazon. I challenge readers to step outside a long-standing dominant paradigm in modern Western culture that a priori regards “hallucinogenic” drug use as necessarily maleficent and devoid of any merit. I intend for my discussion to confront assumptions about drugs that have unjustly perpetuated the disparagement and prohibition of some kinds of psychoactive substance use. More broadly, I intend for it to challenge assumptions about intelligence that constrain contemporary educational thought. “Entheogen” is a word coined by scholars proposing to replace the term “psychedelic” (Ruck, Bigwood, Staples, Ott, & Wasson, 1979), which was felt to overly connote psychological and clinical paradigms and to be too socio-culturally loaded from its 1960s roots to appropriately designate the revered plants and substances used in traditional rituals. I use both terms in this article: “entheogen” when referring to a substance used as a spiritual or sacramental tool, and “psychedelic” when referring to one used for any number of purposes during or following the so-called psychedelic era of the 1960s (recognizing that some contemporary non-indigenous uses may be entheogenic—the categories are by no means clearly discreet). What kinds of plants or chemicals fall into the category of entheogen is a matter of debate, as a large number of inebriants—from coca and marijuana to alcohol and opium—have been venerated as gifts from the gods (or God) in different cultures at different times. For the purposes of this article, however, I focus on the class of drugs that Lewin (1924/1997) termed “phantastica,” a name deriving from the Greek word for the faculty of imagination (Shorter Oxford English Dictionary, 1973). Later these substances became known as hallucinogens or psychedelics, a class whose members include lysergic acid derivatives, psilocybin, mescaline and dimethyltryptamine. With the exception of mescaline, these all share similar chemical structures; all, including mescaline, produce similar phenomenological effects; and, more importantly for the present discussion, all have a history of ritual use as psychospiritual medicines or, as I argue, cultural tools to facilitate cognition (Schultes & Hofmann, 1992). One of the questions raised by this trend of liberalization in otherwise prohibitionist regulatory regimes is what benefits substances such as ayahuasca have. The discussion that follows takes up this question with respect to contemporary psychological theories about intelligence and touches on potential ramifications for education. The next section examines the metaphor of “plant teachers,” which is not uncommon among cultures that have traditionally practiced the entheogenic use of plants. Following that, I use Howard Gardner’s theory of multiple intelligences (1983) as a theoretical framework with which to account for cognitive implications of entheogen use. Finally, I take up a discussion of possible relevance of existential intelligence and entheogens to education. Before moving on to a broader discussion of intelligence(s), I will provide some background on ayahuasca and entheogens. Ayahuasca has been a revered “plant teacher” among dozens of South American indigenous peoples for centuries, if not longer (Luna, 1984; Schultes & Hofmann, 1992). The word ayahuasca is from the Quechua language of indigenous peoples of Ecuador and Peru, and translates as “vine of the soul” (Metzner, 1999). Typically, it refers to a tea made from a jungle liana, Banisteriopsis caapi, with admixtures of other plants, but most commonly the leaves of a plant from the coffee family, Psychotria viridis (McKenna, 1999). These two plants respectively contain harmala alkaloids and dimethyltryptamine, two substances that when ingested orally create a biochemical synergy capable of producing profound alterations in consciousness (Grob, et al., 1996; McKenna, Towers & Abbot, 1984). Among the indigenous peoples of the Amazon, ayahuasca is one of the most valuable medicinal and sacramental plants in their pharmacopoeias. Although shamans in different tribes use the tea for various purposes, and have varying recipes for it, the application of ayahuasca as an effective tool to attain understanding and wisdom is one of the most prevalent (Brown, 1986; Dobkin de Rios, 1984). Notwithstanding the explosion of popular interest in psychoactive drugs during the 1960s, ayahuasca until quite recently managed to remain relatively obscure in Western cultureiii. However, the late 20th century saw the growth of religious movements among non-indigenous people in Brazil syncretizing the use of ayahuasca with Christian symbolism, African spiritualism, and native ritual. Two of the more widespread ayahuasca churches are the Santo Daime (Santo Daime, 2004) and the União do Vegetal (União do Vegetal, 2004). These organizations have in the past few decades gained legitimacy as valid, indeed valuable, spiritual practices providing social, psychological and spiritual benefits (Grob, 1999; Riba, et al., 2001). Ayahuasca is not the only “plant teacher” in the pantheon of entheogenic tools. Other indigenous peoples of the Americas have used psilocybin mushrooms for millennia for spiritual and healing purposes (Dobkin de Rios, 1973; Wasson, 1980). Similarly, the peyote cactus has a long history of use by Mexican indigenous groups (Fikes, 1996; Myerhoff, 1974; Stewart, 1987), and is currently widely used in the United States by the Native American Church (LaBarre, 1989; Smith & Snake, 1996). And even in the early history of Western culture, the ancient Indo-Aryan texts of the Rig Veda sing the praises of the deified Soma (Pande, 1984). Although the taxonomic identity of Soma is lost, it seems to have been a plant or mushroom and had the power to reliably induce mystical experiences—an “entheogen” par excellence (Eliade, 1978; Wasson, 1968). The variety of entheogens extends far beyond the limited examples I have offered here. However, ayahuasca, psilocybin mushrooms, peyote and Soma are exemplars of plants which have been culturally esteemed for their psychological and spiritual impacts on both individuals and communities. In this article I argue that the importance of entheogens lies in their role as tools, as mediators between mind and environment. Defining a psychoactive drug as a tool—perhaps a novel concept for some—invokes its capacity to effect a purposeful change on the mind/body. Commenting on Vygotsky’s notions of psychological tools, John-Steiner and Souberman (1978) note that “tool use has . . . important effects upon internal and functional relationships within the human brain” (p. 133). Although they were likely not thinking of drugs as tools, the significance of this observation becomes even more literal when the tools in question are plants or chemicals ingested with the intent of affecting consciousness through the manipulation of brain chemistry. Indeed, psychoactive plants or chemicals seem to defy the traditional bifurcation between physical and psychological tools, as they affect the mind/body (understood by modern psychologists to be identical). It is important to consider the degree to which the potential of entheogens comes not only from their immediate neuropsychological effects, but also from the social practices—rituals—into which their use has traditionally been incorporated (Dobkin de Rios, 1996; Smith, 2000). The protective value that ritual provides for entheogen use is evident from its universal application in traditional practices (Weil, 1972/1986). Medical evidence suggests that there are minimal physiological risks associated with psychedelic drugs (Callaway, et al., 1999; Grinspoon & Bakalar, 1979/1998; Julien, 1998). Albert Hofmann (1980), the chemist who first accidentally synthesized and ingested LSD, contends that the psychological risks associated with psychedelics in modern Western culture are a function of their recreational use in unsafe circumstances. A ritual context, however, offers psychospiritual safeguards that make the potential of entheogenic “plant teachers” to enhance cognition an intriguing possibility. Howard Gardner (1983) developed a theory of multiple intelligences that originally postulated seven types of intelligence (iv). Since then, he has added a “naturalist” intelligence and entertained the possibility of a “spiritual” intelligence (1999a; 1999b). Not wanting to delve too far into territory fraught with theological pitfalls, Gardner (1999a) settled on looking at “existential” intelligence rather than “spiritual” intelligence (p. 123). Existential intelligence, as Gardner characterizes it, involves having a heightened capacity to appreciate and attend to the cosmological enigmas that define the human condition, an exceptional awareness of the metaphysical, ontological and epistemological mysteries that have been a perennial concern for people of all cultures (1999a). In his original formulation of the theory, Gardner challenges (narrow) mainstream definitions of intelligence with a broader one that sees intelligence as “the ability to solve problems or to fashion products that are valued in at least one culture or community” (1999a, p. 113). He lays out eight criteria, or “signs,” that he argues should be used to identify an intelligence; however, he notes that these do not constitute necessary conditions for determining an intelligence, merely desiderata that a candidate intelligence should meet (1983, p. 62). He also admits that none of his original seven intelligences fulfilled all the criteria, although they all met a majority of the eight. For existential intelligence, Gardner himself identifies six which it seems to meet; I will look at each of these and discuss their merits in relation to entheogens. One criterion applicable to existential intelligence is the identification of a neural substrate to which the intelligence may correlate. Gardner (1999a) notes that recent neuropsychological evidence supports the hypothesis that the brain’s temporal lobe plays a key role in producing mystical states of consciousness and spiritual awareness (p. 124-5; LaPlante, 1993; Newberg, D’Aquili & Rause, 2001). He also recognizes that “certain brain centres and neural transmitters are mobilized in [altered consciousness] states, whether they are induced by the ingestion of substances or by a control of the will” (Gardner, 1999a, p.125). Another possibility, which Gardner does not explore, is that endogenous dimethyltryptamine (DMT) in humans may play a significant role in the production of spontaneous or induced altered states of consciousness (Pert, 2001). DMT is a powerful entheogenic substance that exists naturally in the mammalian brain (Barker, Monti & Christian, 1981), as well as being a common constituent of ayahuasca and the Amazonian snuff, yopo (Ott, 1994). Furthermore, DMT is a close analogue of the neurotransmitter 5-hydroxytryptamine, or serotonin. It has been known for decades that the primary neuropharmacological action of psychedelics has been on serotonin systems, and serotonin is now understood to be correlated with healthy modes of consciousness. One psychiatric researcher has recently hypothesized that endogenous DMT stimulates the pineal gland to create such spontaneous psychedelic states as near-death experiences (Strassman, 2001). Whether this is correct or not, the role of DMT in the brain is an area of empirical research that deserves much more attention, especially insofar as it may contribute to an evidential foundation for existential intelligence. Another criterion for an intelligence is the existence of individuals of exceptional ability within the domain of that intelligence. Unfortunately, existential precocity is not something sufficiently valued in modern Western culture to the degree that savants in this domain are commonly celebrated today. Gardner (1999a) observes that within Tibetan Buddhism, the choosing of lamas may involve the detection of a predisposition to existential intellect (if it is not identifying the reincarnation of a previous lama, as Tibetan Buddhists themselves believe) (p. 124). Gardner also cites Czikszentmilhalyi’s consideration of the “early-emerging concerns for cosmic issues of the sort reported in the childhoods of future religious leaders like Gandhi and of several future physicists” (Gardner, 1999a, p. 124; Czikszentmilhalyi, 1996). Presumably, some individuals who are enjoined to enter a monastery or nunnery at a young age may be so directed due to an appreciable manifestation of existential awareness. Likewise, individuals from indigenous cultures who take up shamanic practice—who “have abilities beyond others to dream, to imagine, to enter states of trance” (Larsen, 1976, p. 9)—often do so because of a significant interest in cosmological concerns at a young age, which could be construed as a prodigious capacity in the domain of existential intelligencev (Eliade, 1964; Greeley, 1974; Halifax, 1979). Gardner notes that as with other more readily accepted types of intelligence, there is no specific truth that one would attain with existential intelligence—for example, as musical intelligence does not have to manifest itself in any specific genre or category of music, neither does existential intelligence privilege any one philosophical system or spiritual doctrine. As Gardner (1999a) puts it, “there exists [with existential intelligence] a species potential—or capacity—to engage in transcendental concerns that can be aroused and deployed under certain circumstances” (p. 123). Reports on uses of psychedelics by Westerners in the 1950s and early 1960s—generated prior to their prohibition and, some might say, profanation—reveal a recurrent theme of spontaneous mystical experiences that are consistent with enhanced capacity of existential intelligence (Huxley, 1954/1971; Masters & Houston, 1966; Pahnke, 1970; Smith, 1964; Watts, 1958/1969). Another criterion for admitting an intelligence is identifying a developmental history and a set of expert “end-state” performances for it. Pertaining to existential intelligence, Gardner notes that all cultures have devised spiritual or metaphysical systems to deal with the inherent human capacity for existential issues, and further that these respective systems invariably have steps or levels of sophistication separating the novice from the adept. He uses the example of Pope John XXIII’s description of his training to advance up the ecclesiastic hierarchy as a contemporary illustration of this point (1999a, p. 124). However, the instruction of the neophyte is a manifest part of almost all spiritual training and, again, the demanding process of imparting of shamanic wisdom—often including how to effectively and appropriately use entheogens—is an excellent example of this process in indigenous cultures (Eliade, 1964). A fifth criterion Gardner suggests for an intelligence is determining its evolutionary history and evolutionary plausibility. The self-reflexive question of when and why existential intelligence first arose in the Homo genus is one of the perennial existential questions of humankind. That it is an exclusively human trait is almost axiomatic, although a small but increasing number of researchers are willing to admit the possibility of higher forms of cognition in non-human animals (Masson & McCarthy, 1995; Vonk, 2003). Gardner (1999a) argues that only by the Upper Paleolithic period did “human beings within a culture possess a brain capable of considering the cosmological issues central to existential intelligence” (p. 124) and that the development of a capacity for existential thinking may be linked to “a conscious sense of finite space and irreversible time, two promising loci for stimulating imaginative explorations of transcendental spheres” (p. 124). He also suggests that “thoughts about existential issues may well have evolved as responses to necessarily occurring pain, perhaps as a way of reducing pain or better equipping individuals to cope with it” (Gardner, 1999a, p. 125). As with determining the evolutionary origin of language, tracing a phylogenesis of existential intelligence is conjectural at best. Its role in the development of the species is equally difficult to assess, although Winkelman (2000) argues that consciousness and shamanic practices—and presumably existential intelligence as well—stem from psychobiological adaptations integrating older and more recently evolved structures in the triune hominid brain. McKenna (1992) goes even so far as to postulate that the ingestion of psychoactive substances such as entheogenic mushrooms may have helped stimulate cognitive developments such as existential and linguistic thinking in our proto-human ancestors. Some researchers in the 1950s and 1960s found enhanced creativity and problem-solving skills among subjects given LSD and other psychedelic drugs (Harman, McKim, Mogar, Fadiman & Stolaroff, 1966; Izumi, 1970; Krippner, 1985; Stafford & Golightly, 1967), skills which certainly would have been evolutionarily advantageous to our hominid ancestors. Such avenues of investigation are beginning to be broached again by both academic scholars and amateur psychonauts (Dobkin de Rios & Janiger, 2003; Spitzer, et al., 1996; MAPS Bulletin, 2000). The final criterion Gardner mentions as applicable to existential intelligence is susceptibility to encoding in a symbol system. Here, again, Gardner concedes that there is abundant evidence in favour of accepting existential thinking as an intelligence. In his words, “many of the most important and most enduring sets of symbol systems (e.g., those featured in the Catholic liturgy) represent crystallizations of key ideas and experiences that have evolved within [cultural] institutions” (1999a, p. 123). Another salient example that illustrates this point is the mytho-symbolism ascribed to ayahuasca visions among the Tukano, an Amazonian indigenous people. Reichel-Dolmatoff (1975) made a detailed study of these visions by asking a variety of informants to draw representations with sticks in the dirt (p. 174). He compiled twenty common motifs, observing that most of them bear a striking resemblance to phosphene patterns (i.e. visual phenomena perceived in the absence of external stimuli or by applying light pressure to the eyeball) compiled by Max Knoll (Oster, 1970). The Tukano interpret these universal human neuropsychological phenomena as symbolically significant according to their traditional ayahuasca-steeped mythology, reflecting the codification of existential ideas within their culture. Narby (1998) also examines the codification of symbols generated during ayahuasca experiences by tracing similarities between intertwining snake motifs in the visions of Amazonian shamans and the double-helix structure of deoxyribonucleic acid. He found remarkable similarities between representations of biological knowledge by indigenous shamans and those of modern geneticists. More recently, Narby (2002) has followed up on this work by bringing molecular biologists to the Amazon to participate in ayahuasca ceremonies with experiences shamans, an endeavour he suggests may provide useful cross-fertilization in divergent realms of human knowledge. The two other criteria of an intelligence are support from experimental psychological tasks and support from psychometric findings. Gardner suggests that existential intelligence is more debatable within these domains, citing personality inventories that attempt to measure religiosity or spirituality; he notes, “it remains unclear just what is being probed by such instruments and whether self-report is a reliable index of existential intelligence” (1999a, p. 125). It seems transcendental states of consciousness and the cognition they engender do not lend themselves to quantification or easy replication in psychology laboratories. However, Strassman, Qualls, Uhlenhuth, & Kellner (1994) developed a psychometric instrument—the Hallucinogen Rating Scale—to measure human responses to intravenous administration of DMT, and it has since been reliably used for other psychedelic experiences (Riba, Rodriguez-Fornells, Strassman, & Barbanoj, 2001). One historical area of empirical psychological research that did ostensibly stimulate a form of what might be considered existential intelligence was clinical investigations into psychedelics. Until such research became academically unfashionable and then politically impossible in the early 1970s, psychologists and clinical researchers actively explored experimentally-induced transcendent experiences using drugs in the interests of both pure science and applied medical treatments (Abramson, 1967; Cohen, 1964; Grinspoon & Bakalar, 1979/1998; Masters & Houston, 1966). One of the more famous of these was Pahnke’s (1970) so-called “Good Friday” experiment, which attempted to induce spiritual experiences with psilocybin within a randomized double-blind control methodology. His conclusion that mystical experiences were indeed reliably produced, despite methodological problems with the study design, was borne out by a critical long-term follow-up (Doblin, 1991), which raises intriguing questions about both entheogens and existential intelligence. Studies such as Pahnke’s (1970), despite their promise, were prematurely terminated due to public pressure from a populace alarmed by burgeoning contemporary recreational drug use. Only about a decade ago did the United States government give researchers permission to renew (on a very small scale) investigations into psychedelics (Strassman 2001; Strassman & Qualls, 1994). Cognitive psychologists are also taking an interest in entheogens such as ayahuasca (Shanon, 2002). Regardless of whether support for existential intelligence can be established psychometrically or in experimental psychological tasks, Gardner’s theory expressly stipulates that not all eight criteria must be uniformly met in order for an intelligence to qualify. Nevertheless, Gardner claims to “find the phenomenon perplexing enough, and the distance from other intelligences great enough” (1999a, p. 127) to be reluctant “at present to add existential intelligence to the list . . . . At most [he is] willing, Fellini-style, to joke about ‘8½ intelligences’” (p. 127). I contend that research into entheogens and other means of altering consciousness will further support the case for treating existential intelligence as a valid cognitive domain. In a more literary expression of this notion, Huxley’s final novel Island (1962) portrays an ideal culture that has achieved a balance of scientific and spiritual thinking, and which also incorporates the ritualized use of entheogens for education. The representation of drug use that Huxley portrays in Island contrasts markedly with the more widely-known soma of his earlier novel, Brave New World (1932/1946): whereas soma was a pacifier that muted curiosity and served the interests of the controlling elite, the entheogenic “moksha medicine” of Island offered liminal experiences in young adults that stimulated profound reflection, self-actualization and, I submit, existential intelligence. Huxley’s writings point to an implicit recognition of the capacity of entheogens to be used as educational “tools”. The concept of tool here refers not merely the physical devices fashioned to aid material production, but, following Vygotsky (1978), more broadly to those means of symbolic and/or cultural mediation between the mind and the world (Cole, 1996; Wertsch, 1991). Of course, deriving educational benefit from a tool requires much more than simply having and wielding it; one must also have an intrinsic respect for the object qua tool, a cultural system in which the tool is valued as such, and guides or teachers who are adept at using the tool to provide helpful direction. As Larsen (1976) remarks in discussing the phenomenon of would-be “shamans” in Western culture experimenting with mind-altering chemicals: “we have no symbolic vocabulary, no grounded mythological tradition to make our experiences comprehensible to us . . . no senior shamans to help ensure that our [shamanic experience of] dismemberment be followed by a rebirth” (p. 81). Given the recent history of these substances in modern Western culture, it is hardly surprising that they have been demonized (Hofmann, 1980). However, cultural practices that have traditionally used entheogens as therapeutic agents consistently incorporate protective safeguards—set, setting viii, established dosages, and mythocultural respect (Zinberg, 1984). The fear that inevitably arises in modern Western culture when addressing the issue of entheogens stems, I submit, not from any properties intrinsic to the substances themselves, but rather from a general misunderstanding of their power and capacity as tools. Just as a sharp knife can be used for good or ill, depending on whether it is in the hands of a skilled surgeon or a reckless youth, so too can entheogens be used or misused. The use of entheogens such as ayahuasca is exemplary of the long and ongoing tradition in many cultures to employ psychoactives as tools that stimulate foundational types of understanding (Tupper, in press). That such substances are capable of stimulating profoundly transcendent experiences is evident from both the academic literature and anecdotal reports. Accounting fully for their action, however, requires going beyond the usual explanatory schemas: applying Gardner’s (1999a) multiple intelligence theory as a heuristic framework opens new ways of understanding entheogens and their potential benefits. At the same time, entheogens bolster the case for Gardner’s proposed addition of existential intelligence. This article attempts to present these concepts in such a way that the possibility of using entheogens as tools is taken seriously by those with an interest in new and transformative ideas in education.